Marjayoun (Arabic: مرجعيون‎: Lebanese pronunciation[ˈmaɾʒ.ʕajuːn]), also Marj 'Ayoun, Marjuyun or Marjeyoun - meaning "meadow of springs") is both a Lebanese town (also known as Jdeideh / Jdeida / Jdeidet Marjeyoun) and an administrative district, Marjeyoun District, in the Nabatieh Governorate in Southern Lebanon. It is 860 metres (2,822 ft) above sea level, and is located on the west side of the Jordan Rift Valley Bank just across from the ancient regional capital, Caesarea Philippi, which was located at the foot of Mt. Hermon on the east side of the Rift Valley. It is not to be confused with the Banias Springs at Caesarea Philippi. Marjeyoun is on a hill facing Mount Hermon to the East, Beaufort Castle, the 1000-year-old Crusader Castle above the Litani River and overlooking Mount Amel (Jabal Amel) to the West, the summits of Rihan and Niha and the rest of the Mount Lebanon range to the North and the fertile plains of Marjeyoun that extend southward into the Galilee plains and the Golan Heights. On June 10, 1179, during the Battle of Marj Ayyun, an Ayyubid army commanded by Saladin defeated a Crusader army led by King Baldwin IV of Jerusalem. The Christian king narrowly escaped being captured in the rout. The historic Cathedral of Saint Peter is in Marjayoun. In the 1596 tax records, it was named as a village, Jadida, in the Ottoman nahiya (subdistrict) of Tibnin under the liwa' (district) of Safad, with a population of 28 households and 12 bachelors, all Muslim. The villagers paid a fixed tax-rate of 25% on agricultural products, such as wheat, barley, olive trees, vineyards, goats and beehives, in addition to "occasional revenues" and a press for olive oil or grape syrup; a total of 9,606 akçe. In 1875 Victor Guérin visited Marjayoun (which he called Djedeideh), and found it to have about 2,000 inhabitants, mostly "Schismatic Greek" (i.e. Melkite Uniats), but also some Greek Orthodox and Muslims. 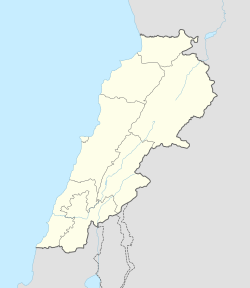 During the Syria-Lebanon Campaign of World War II, British and Australian forces advancing from Palestine entered the town on 11 June 1941 against badly equipped defenders, but were forced to withdraw on 15 June following a Vichy French counterattack. The Allies recaptured the town on 24 June in the Battle of Merdjayoun. It also was the headquarters of the South Lebanon Army, the Israel-affiliated militia that controlled southern Lebanon during Israel's occupation of the region after the 1982 Lebanon War until Israel's withdrawal from the region in 2000. After cease-fire negotiations stalled on August 10, 2006, Israeli forces took control of Marjayoun. The next day, a convoy of 3,000 people fled from the town. The convoy was attacked by the Israeli Air Force (IAF) northeast of Hasbaya en route to Kefraya, in the south of the Bekaa valley. The bombing resulted in the deaths of at least seven people, and is known as the Marjayoun convoy incident. The town of Marjayoun has an overwhelmingly Christian population of about 5,000 people. Greek Orthodox Christians compose the vast majority of the town's population, however there are also Maronite Christians and Greek Catholic Christians living in Marjayoun. Outside the town, most villages in the surrounding valleys and mountains surrounding are predominantly Shia Muslim. The district of Marjayoun, which covers a greater area than the town, is largely Shia Muslim. It recognizes three seats in the Lebanese government, two belonging to Shia Muslims and one belonging to Orthodox Christians. Marjayoun is home to a regional government hospital, and a Lebanese Red Cross First Aid Center. Walid Gholmieh – director of the Le Conservatoire libanais national supérieur de musique; born in Marjeyoun. Alfred Naifeh was born 1915 in Covington, Tennessee, to a Lebanese immigrant family from Jdeidet Marjeyoun and had U.S. naval destroyer USS Naifeh named after him. James Jabara was a Lebanese-American U.S. Air force Major and the first jet ace of the Korean war, who flew missions both in WW II and Viet Nam and was born in 1923 in Muskogee, Oklahoma but whose ancestral home, father John Jabara and mother, are from Marjeyoun. Michael DeBakey (1908–2008) cardiac surgeon, whose parents are from Marjeyoun. George Jordac (1931–2014), author and poet. Brigitte Gabriel, journalist, author and lecturer. Major Saad Haddad, the founder and head of the South Lebanon Army (SLA) during the Lebanese Civil War. ^ Alsalem, Reem (9 September 2006). "Lebanese struggle to repair far wider damage than destroyed houses". Electronic Intifada. Retrieved 16 December 2015. ^ Jean Tsadik (2001). "Facétie de l'histoire (suite)" (in French). Archived from the original on 2007-10-07. Retrieved 2016-09-08. ^ Hirst, David. 1999. South Lebanon: The war that never ends? Journal of Palestine Studies 28(3). Guérin, Victor (1880). Description Géographique Historique et Archéologique de la Palestine (in French). 3: Galilee, pt. 2. Paris: L'Imprimerie Nationale. HRW (2007). Why They Died: Civilian Casualties in Lebanon During the 2006 War. Human Rights Watch. Riley - Smith, Jonathan (1973). The Feudal Nobility and the Kingdom of Jerusalem 1174 - 1277. London: The Macmillan Press Ltd. ISBN 0-208-01348-2.